We regularly host corporate events of all different sizes on weekday nights, please call to discuss. Why not arrange an adventurous day in the country for your staff followed by a lovely meal, songs round the campfire and a bacon sandwich before you hop on the tube to work the next morning. Or if you are looking for something bigger then why not talk to us about arranging a conference through one of our event planner partners... The clip below shows the type of thing we can organise for you through the brilliant Let's Go Anywhere team. If you're looking for a more informal gathering of your nearest and dearest, the site is also available for private hire for groups of up to 51. You would hire the site for two nights, giving you plenty of time with friends or family. We can help arrange minibuses to collect people from either Elstree & Borehamwood station or from a local tube stop. We can help you to arrange a caterer and set up long trestle tables in our party tent (which will easily seat up to 60 so plenty of room for any extra friends), or you can use the Barn to create a more rustic feeling meal. There is lots of space for a game of football, cricket or rounders. As you would bring your own booze and food, this is a very good way of keeping costs down for a party. 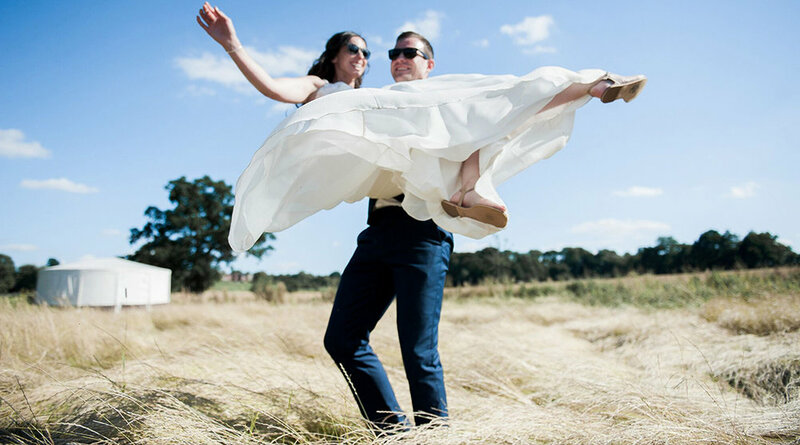 Set in the 100 acres of farmland, with rolling hills and beautiful views its the perfect place to let your hair down and have a wonderful day with your friends and family. If you decide to book your wedding with us you will be given access to the whole glampsite with accommodation for up to 51 people. You can offer a tent to your nearest and dearest, allowing you to make a whole weekend out of your special day. We have a beautiful and secluded lake which is perfect for some private photos, and our gorgeous bathroom cabins have 8 flushing loos so no need to hire portaloos. We also have our large covered barn, which your caterers can use and which you can set up as a separate chill out area away from the dance floor. If you are interested please email: jess@homefarmglamping and let us know what you are after and the weekend of the big day.